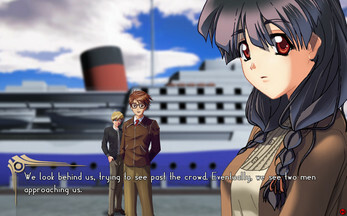 Errant Heart is a Visual Novel game. It currently has a word count of approximately 120,000, which we estimate would yield somewhere between 3-8 hours of reading depending on your speed. 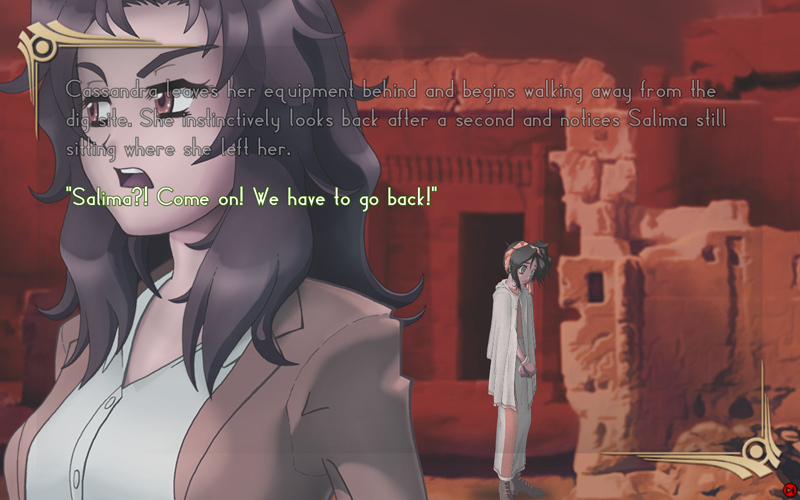 It contains approximately two dozen event CGs, dozens of backgrounds by the talented Owen Carson, has had story editing provided by the insightful Lillian Diaz-Przybyl and is partially voiced with almost 800 lines of spoken dialog thanks to Apphia Yu. Jill Harris, Karen Hayman, Matt Shipman, Kevin M. Connolly, Brittany Lauda, Karen Kahler, Bryn Apprill, Devon Talbott and David Lyons. 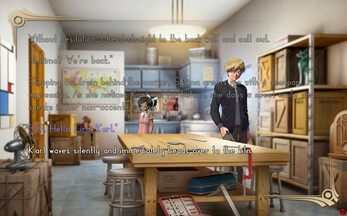 The general theme of the game is slice-of-life mixed with supernatural suspense. Version 1.0 has just been released to the public. Check back regularly and/or check our Twitter or Facebook or our website for updates to the build. Errant Heart takes place in a fictional 1940's European city (sans Hitler and Nazis) and follows the exploits of a young painter, Lira Moretti. As she leaves home in order to establish herself as an artist in the cosmopolitan mainland city of San Moritz, she has a bizarre encounter with a street urchin which leaves her with a gap in her memory. As she settles in to life in San Moritz, Lira struggles to choose between starting her painting career or following up on the bizarre circumstances that she encountered upon her arrival. 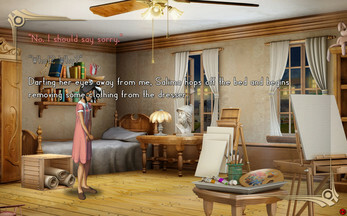 Eventually, after having apparently been followed by the street urchin, Salima draws Lira deeper into an extraordinary world where the passage of time takes on new meaning—a world which runs parallel but utterly unseen to the eyes of the banal. How much ya got? No, seriously. We're offering Errant Heart free of charge. Or, perhaps it would be more accurate to say, we're offering it as a "pay what you think it's worth" model. So why would we do this? 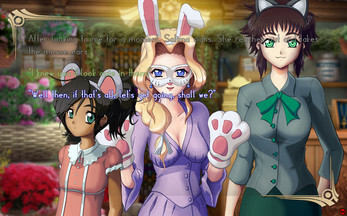 First of all, Errant Heart represents our first foray into the world of Visual Novels. You could say it's an unproven product. We don't really know if people will enjoy it. And unlike some individuals who believe artists deserve to be paid for their work, we do not necessarily hold that as an immutable truth. Instead, we believe artists deserve precisely as much as their patrons are willing to give them. Besides which, being an unproven product, we're more interested in spreading the word and upping the visibility of Errant Heart. What better way to do that than to let people try the game for free? After all, art doesn't do much good if others can't experience it. Secondly, this iteration of Errant Heart is roughly one quarter of our total vision. This incarnation reflects just how far we can take the project with only our free time and with the backing of a modest Kickstarter. We believe it is still a full, complete game—even if it does end on a bit of a cliffhanger. However, there's so much more that we'd like to do with it. As such, we hope that the "pay what you want" model will not only encourage people to play and enjoy Errant Heart, but also encourage them to make a modest monetary contribution if they like what they see and would like to see more. Additional story arcs, more sprites, more backgrounds, more event CGs, more music, more special effects, and perhaps even a few additional surprises—these are some of the items that your contributions will help fund. We're a two-man-crew who, for the last decade, have been working under our studio name, Pseudomé Studio LLC. We've worked on animation projects, webcomics and print comics. If you want a succinct overview of our last project ( Van Von Hunter), you may want to consider checking out the Wiki. First and foremost, we are ardent believers in good, robust story-telling and compelling, interesting characters. For the longest time we knew about the medium of Visual Novels, but we had always assumed that they were just vehicles for dating simulators—something in which we had little interest. It wasn't until we happened across a title called Tsukihime that everything changed. 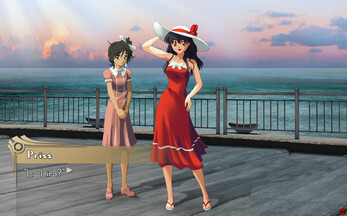 It showed us that the format of Visual Novels could indeed be used as a means of robust story-telling. It could indeed contain interesting and compelling characters. Of course, we followed and consumed as much Type-Moon content as we could in the intervening years—Kagetsu Tohya, Fate/stay night, Fate/Zero, Fate Extra, Fate/unlimited codes, Unlimited Blade Works, Kara no Kyoukai, etc. And along the way we came across other studios with a similar penchant for unique story telling through Visual Novels, like Nitro+ and titles such as Saya no Uta and Steins;Gate. So that's a long-winded way of saying that Errant Heart was created in the tradition of Visual Novels from those sort of studios. A secondary reason why you may be interested in playing Errant Heart has to do with the visuals. Something we dislike, but is incredibly common in Visual Novels is static artwork. 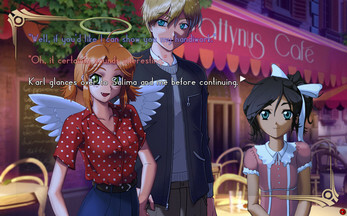 Find a random visual novel title and find a Let's Play on YouTube. Now scrub the search bar and watch the little preview window. Does it take minutes-on-end for the imagery to change? I'll bet it does. Given our background in comics and animation, we wanted to avoid that. So we've built Errant Heart in such a way that we hope it plays more like an animatic than a boring slide show. To that end we have implemented myriad techniques to help keep up visual interest, such as multiple character poses, outfits, hair styles, lighting effects, zoom levels, set props, camera panning and other special effects. Please feel free to check out our YouTube channel for sample videos. And if you're so inclined, please leave a comment below, or consider visiting our subreddit to post about any issues you may have come across, any thoughts, criticisms or questions you might have in regards to Errant Heart. Installation is straight forward. Simply select and download the version of the game which corresponds to the type of computer you use. Then, unzip/unpack the download to any location you like and run the .exe from the root directory. Really liked it, finished one of the endings only and im really looking up to the other ones and eventually the full release of the game! I quirk my eyebrow. I quirk my eyebrow. I quirk my eyebrow. I quirk my eyebrow. I quirk my eyebrow. I quirk my eyebrow. I quirk my eyebrow. I quirk my eyebrow. I quirk my eyebrow. I quirk my eyebrow. I quirk my eyebrow. I quirk my eyebrow. I quirk my eyebrow. I rub my temple.I rub my temple.I rub my temple.I rub my temple.I rub my temple.I rub my temple.I rub my temple.I rub my temple.I rub my temple.I rub my temple.I rub my temple.I rub my temple.I rub my temple.I rub my temple.I rub my temple.I rub my temple. I ... can... hardly believe this beautiful game is 'name your own price' - I think I read the description a few times over to make sure. Well, we did insert a hint system at each dead end. 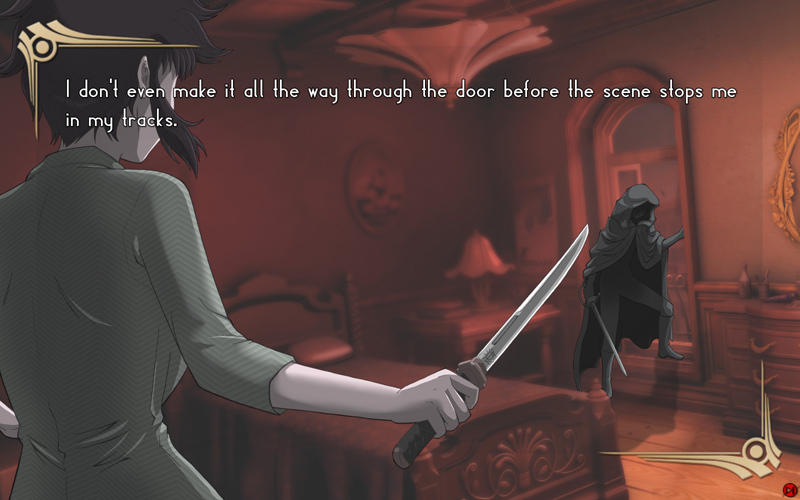 If invoked, "Professor Cassandra" should provide a suggestion about how you can get past a given "bad end". There's only one part in the game that, in our estimation, might be a little tricky. 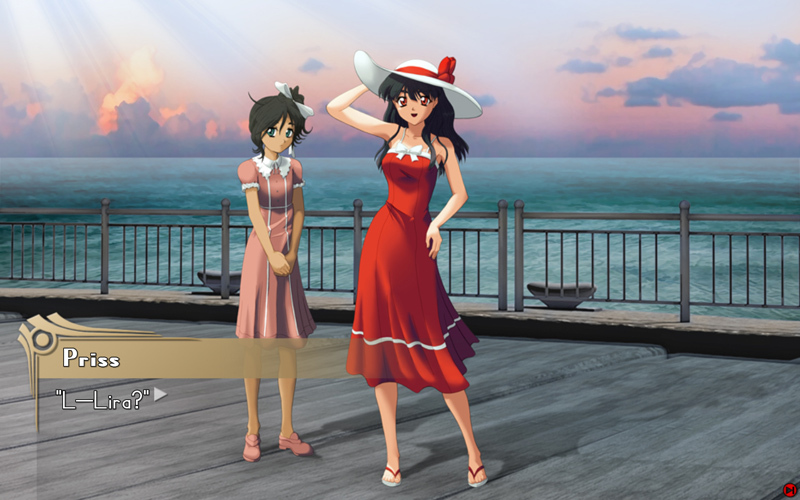 But, even if you have to back track quite a way in order to correct the issue, we also implemented a skip system which should let you skip past any scene you've already viewed. That being said, we have considered making a Let's Play. Well, since it'd be from the creators, it'd be more like a Let's Play mixed with "director's commentary". But, not sure there's really enough interest to create such a thing. Regardless, thanks for the comment. I know that this a really late response, but that is such a great idea!!!! Hello! I managed to finish at least a route of the game (one without dying and besides the Elena route, of course). And there's just a lot of things that I don't get. Well, given I finished one route (just yet)... I'll try a couple more later on. 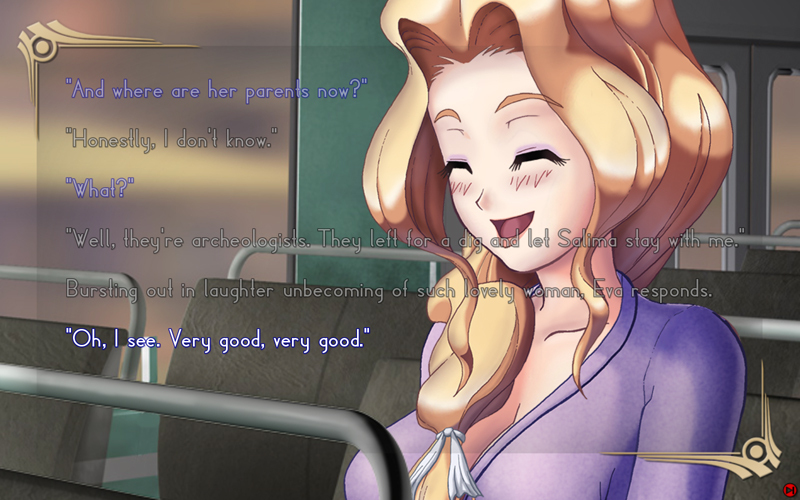 Anyway, the mystery's gnawing up on me and even in this one route, there are a couple of loose ends. I'm not sure if they're intentional (like, maybe we're supposed to finish all routes to get the whole picture?) but still! I felt compelled to voice these nonetheless, though preferably in a more private one? Lest other fans won't mind me spoiling a whole chunk in here? lol Do you guys have a general email for accepting questions and/or beta-reviews? That aside, the art was splendid, especially the backgrounds and the story-telling was nice. So far, I've enjoyed it very much! :D I'm saving right now (T^T) but I'm hoping when the final full game is up, I'd be able to buy it off and/ donate as much as I can to help you guys off. I can see that you really put great effort in completing this game after all. It was amazingly done and I'm very thankful of you guys for sharing this work to us, for free no less! :> I hope you keep this up and haven't given up on this project just yet. Anyway, hoping to hear more from you soon. Good luck! Thanks for the comments and glad you enjoyed the game. Just label the title as containing spoilers. This might be useful if other people who have played through the game have similar questions. Aside from that, you could always just email us: pseudome@pseudome.net. I was slightly disappointed when I reached a dead end at Elena's path. I liked her, such a pity. :P I do hope you guys do get the opportunity to further the game. I wish I could contribute, but sadly, I still have no means of doing that (at least, I don't, until I graduate, which is a relatively long time from now). But, anyways, it's a great game so far! I love the art and the music, and the lit major in me is basking under the glory of the story. I do have a minor issue though, I can't save the game. I think the error is that there's no valid save location? As for not being able to save? I've not come across anyone with that issue yet. However, my suspicion is that you probably have the Windows version? And perhaps you unzipped it into a Windows 7/8/10 environment? If so, I'm betting that Windows made sure to keep the directories and files "read only"—which would prevent the game for writing any data (like a save game) to your disk. If that is the case, you may be able to get around the issue by changing the security properties of the Errant Heart directory to allow writing/modifying of files. In any case, glad you've enjoyed the game thus far, and hope you enjoy the rest. is this a kinetic vn? Not in the strictest sense. There are some dead ends. There are some "stubs", which would lead to additional character branches (if we ever get the opportunity to make more), and there are some choices that alter the pacing of the existing branches.